The Todo Poder al Pueblo Collective warmly pledges our full support for the demands of the struggling agricultural workers in the Valley of San Quintín, Baja California. 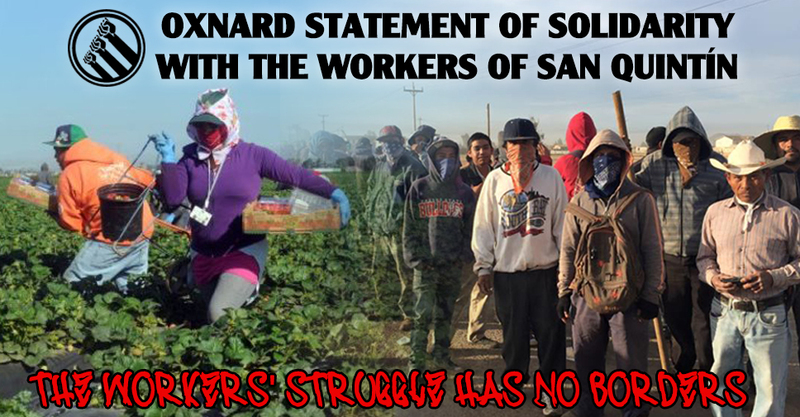 As an all-volunteer, working class organization based in Oxnard, CA, a city which relies on the daily exploitation of thousands of workers who toil in the strawberry, onion, and citrus fields, we understand the need for unconditional solidarity with the workers and campesinos of San Quintín, who are organizing and mobilizing to defend their basic dignity and their social, human, and labor rights. Likewise, we strongly denounce the repression that is being carried out by the government of Mexico and declare our opposition to its deceptive, hypocritical, and lying nature. The Mexican government long ago shut its ears to the demands of the people, and has proven time and again its shameless subservience to the international bankers, local criminal elites, and United States imperialists who have created the poverty-stricken turmoil that affects the lives of our communities on both sides of the border. By taking the side of the parasitic Agricultural industry and charro unions, the government of Enrique Peña Nieto and the discredited political parties have offered clear proof that justice and dignity can only be defended through our own organized efforts as conscious working people, united in the fight to overturn the institutions of capitalist exploitation and oppression that have brought the Mexican working class to ruin. The roots of the present disaster clearly lie in the implementation of the North American Free Trade Agreement (NAFTA), now in its 21st year, which was a part of a major offensive against working people throughout the world launched under the banner of “globalization.” NAFTA unleashed the widespread takeover of the Mexican economy by large American agricultural and manufacturing corporations and in the process, pillars of the Mexican economy ranging from the subsistence farms of small villages to the proud national industries such as PEMEX were either destroyed or robbed from the people. The resulting instability has included major attacks on the rights of workers, the rise of vicious drug cartels, widespread femicides, the ever-increasing corruption of local authorities, and the development of a massive apparatus (DHS-ICE) for the repression, detention and deportation of unauthorized migrants in the United States (i.e. the militarized control of immigrant labor). NAFTA displaced millions of Mexican workers across the continental “free trade zone” in one of the largest mass-migrations known in history, hitting indigenous and poor communities of Mexico the hardest. This ‘economic miracle’ of unrestrained free trade scattered communities from Southern Mexican regions such as Oaxaca and Guerrero to such distant places as San Quintín, Oxnard, Salinas, Fresno, Oregon, Washington, the American Midwest, Florida, and beyond. Despite our contribution to the profits of the super-rich, our communities are still subject to economic insecurity, state violence (including systemic neglect by educational bodies and healthcare institutions), and political non-representation. While we may live in different regions, our exploiters are one and the same: the transnational corporations who go by such names as BerryMex, Driscolls, Sunkist, Nestlé, Costco, and Walmart, among others – monolithic private companies who wield the real power over our elected officials and so-called “representatives.” In addition to mistreating our brothers and sisters in the fields, these same exploiters have rendered our air toxic here in Oxnard through the unrestrained use of various pesticides that form an invisible layer of poison that enshrouds our schools and neighborhoods. The solidarity of the growers in their various associations, and their tight relations with the state, shows the need for us, at the bottom, to strengthen our bonds of solidarity across communities, regions, and borders. In these conditions, the fighting campesinos of San Quintín offer the brightest flashes of hope. By blocking the international highways that expedite the ruthless extraction of wealth from Mexican resources and labor, the proud workers of San Quintín are disrupting and obstructing the arterial veins of an unjust system (capitalism) that would rather see us enslaved than living in dignity and peace. By standing up and rejecting humiliation in the face of widespread sexual abuses, assaults on the rights of labor, and the trampling of human rights, the workers of San Quintín are opening horizons and lifting the morale of workers not only in Baja California, not only in North America, but across the globe. VICTORY TO THE AGRICULTURAL WORKERS OF SAN QUINTIN ~ LONG LIVE THE STRIKE! LONG LIVE INTERNATIONAL LABOR SOLIDARITY AND WORKING-CLASS RESISTANCE! THE WORKERS STRUGGLE HAS NO BORDERS!